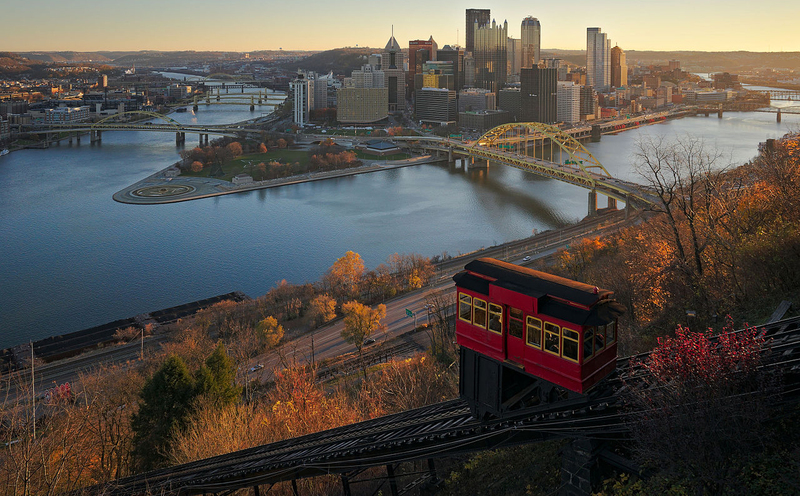 On Tuesday, June 25 explore the city of Pittsburgh including Downtown, The Strip, Oakland and a ride on the Duquesne Incline to view the city from above. The tour includes bus transportation, a professional, uniformed guide to accompany the group, and a ticket to ride the Incline to the top (where the bus will pick up). We recommend comfortable walking shoes, a hat, and sunglasses. Don't forget your camera! 9:00 am Bus pickup from the Westin Hotel to tour the City of Pittsburgh (Downtown, The Strip, Oakland, and other areas that time permits) with a tour guide. 11:30 am Duquesne Incline ride to view the city and ride the Incline one-way. Bus will drop off at bottom and pick up at top. 1:00 pm Drop off at Station Square for shopping and lunch (on own). 3:30 pm Pick up to return to hotel. On Wednesday morning, June 26, discover downtown Pittsburgh's fine old buildings and learn the city's history on a 1.5 hour guided walking tour. The tour will depart from the Westin hotel at 9:30 am. We recommend comfortable walking shoes, a hat, and sunglasses.